During the Protestant Reformation of the sixteenth century, there were few things more precious to believers than the recovery of the biblical doctrine of justification by faith alone in Christ alone. Centuries of semi-Pelagian (and Pelagian) growth were dragged into the light and revealed as the deadly poison they were, and despite fierce opposition, the glorious gospel of grace began to be proclaimed again from pulpits across Europe. As the truth spread, resistance increased, and untold numbers of the faithful suffered persecution and even death rather than renounce or compromise this essential biblical doctrine. Five hundred years later, how many of us who count ourselves heirs of these courageous men and women truly believe that this is a doctrine worth dying for? How many of us even know what the fundamental elements of the doctrine of justification are? Would we be able to recognize a heretical version of this doctrine if we saw it? Many professing evangelicals in our day, whether expressing it in so many words or not, speak and act as if the Reformers were making a mountain out of a molehill — as if the doctrine of justification is really not that important. If the Reformation has floundered in any way, it is largely due to the fact that we have lost sight of the importance of what was restored. It has been said that familiarity breeds contempt. We have heard the words “justification by faith alone” so many times that they have lost their meaning and import. Perhaps the words have become little more than a slogan to us. Perhaps we are able to think and talk about this doctrine (if we think and talk about it at all) without being driven to our knees praising God, in which case we are not really thinking that hard about it at all. Many of us need to go back and relearn the meaning and importance of this precious biblical teaching. A good place to start would be with a classic work by James Buchanan entitled The Doctrine of Justification. James Buchanan (1804-1870) was both a minister and Reformed theologian. He was ordained in the Church of Scotland in 1827 but joined the Free Church in 1843. He served as a minister in the church until 1845 when he was appointed to teach apologetics at the New College in Edinburgh. In 1847, he was appointed to the chair of systematic theology in the same college and held that position until 1868. Among his works are books on affliction, the Holy Spirit, modern atheism, and apologetics. His most well-known work, however, is his defense of the Reformed doctrine of justification, first published in 1867. When Banner of Truth reprinted Buchanan’s book in 1961, it had been for almost one hundred years the only full-scale treatment of the doctrine in English. Thankfully, that situation has changed since 1961, and several full-scale books on the doctrine have been published in English, including R.C. Sproul’s Faith Alone (Baker Books, 1995) and J.V. Fesko’s Justification (P&R Publishing, 2008). Although these works deal with more contemporary issues and debates surrounding the doctrine of justification, Buchanan’s book should not be ignored. The chapters of Buchanan’s book were originally the Cunningham Lectures for 1866 at New College, Edinburgh. They are not dry as many such lectures can be, however. It is probably because Buchanan had been a preacher that these lectures exhibit his passion for truth rather than a detached abstract approach. Following a short introductory essay and brief biography of the author, the book is divided into two parts. 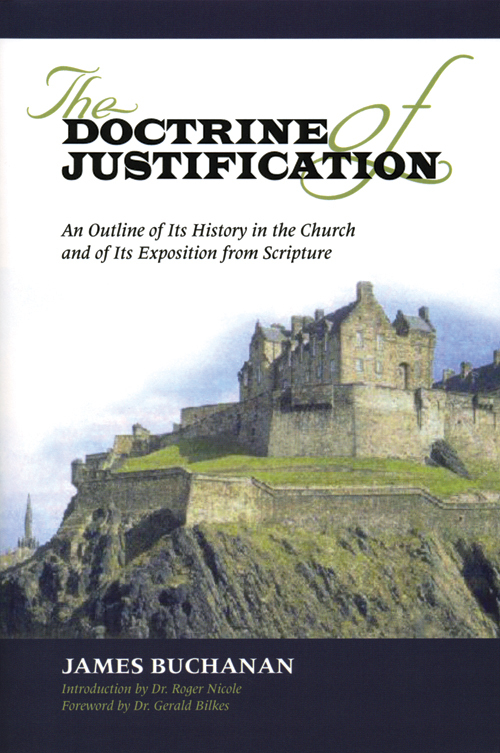 The first seven chapters survey the history of the doctrine of justification. Buchanan traces the doctrine through the Old and New Testaments before looking at its development from the early church to the nineteenth century. Among his most helpful information is his survey in chapter six of the doctrines of various post-Reformation Protestant groups and individuals. Here he looks at the teaching of groups as diverse as the Socinians, Arminians, and Quakers. He also surveys Amyraldianism and neonomianism before jumping into an evaluation of the Marrow Controversy. Part Two of the book is Buchanan’s point-by-point exposition of the doctrine of justification. Here, in eight chapters, he explains and defends the Reformed doctrine as set forth in the Westminster Confession of Faith and Catechisms. These chapters are theology in the best sense of the word — biblical, precise, pious, and practical. The biblical doctrine of justification by faith alone is as precious today as it has always been. I urge any who do not understand what the Bible teaches on the subject or why it is so important to read this book.